An introduction to bread making, no previous experience required. For £75 you get a lovely day in the bakery, a lunch and you’ll go home with 5 fantastic bakes and the recipes to keep you baking. There are limited places on these courses so do make sure to book as early as possible to avoid disappointment! Etruria Canals Festival returns in 2019 on Saturday 1st and Sunday 2nd June 10am-5pm each day. Alongside the historic narrowboat gathering there will be a range of family friendly arts workshops and entertainment, including live music and performances, a range of craft stalls and exhibitors, beer tent and street food. The 2019 event is all about exploring, enjoying and cherishing the natural world. We’re programming a range of hands on activities, arts projects and exhibitors that will bring this theme to life. More details will be released nearer the time. As usual the festivities will take place on the site of Etruria Industrial Museum (Kiln Down Close, Stoke-On-Trent, ST4 7AF) at the junction of the Trent and Mersey and Caldon Canals. To celebrate the start of spring B arts are working with community groups and schools to create a free community event inspired by the springtime festivities of Basant Panchami and Holi. On the day there will be a range of workshops, performances, stalls, and of course lots of kite-making and flying! Stoke on Trent's only Pay as you Feel Cafe. Every Friday from 12 noon until 2pm you are welcomed to come and enjoy a delicious lunch, made by our hardworking volunteers, using our Tesco FareShare donation. Open from 12-2 every Friday, join us! Come and have your say about urban resilience, attractiveness and liveability in our city. 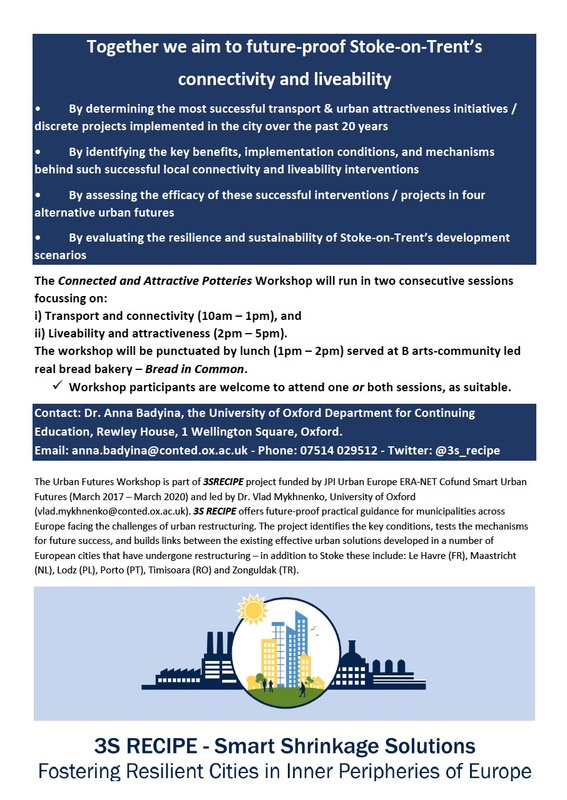 We are pleased to host this special one day workshop, in conjunction with our partners from all across Europe and led by Oxford University – to focus on creativity, urban planning and Stoke’s future. Huge topics! We particularly want artists to contribute to the afternoon discussion, about what artists are doing in Stoke and their role in shaping the future of our marvelous city. And lunch is provided! The event is on Tuesday 12th March, is free to attend and is at B arts building 72 Hartshill Road, Stoke on Trent, ST4 7RB. Please contact us at B arts to reserve your place. Journey to 'The World Beyond' through our Community Lantern parade. The parade is on 8th March but there will be lots of opportunities to get involved before hand with lantern making workshops, music classes and street theatre sessions. View our Facebook page https://www.facebook.com/events/229299551335447/ and select interested or going to keep up to date with what's happening. Join real life artists, makers, and curators in devising, and creating an art exhibition. This course is perfect for children who are particularly interested in art. Children will learn a variety of artistic techniques, relevant to their interest, including curation, as well as expanding their knowledge of artists and their works. The course will encourage critical and lateral thinking and will be an opportunity for the children to express themselves through a means that may not always be easily accessible. Guardians and siblings are also invited to join us for a pay what you feel lunch at 1.30. The course is for 8+ years old. There are only 20 spaces available. So book in whilst you can. We need a minimum of 10 children to run the course so do book in early so as to avoid disappointment. On 15th December we’ll be doing an advanced bread making day that’s a bit more tailor made. This day is ideal for people with some bread making experience, or who have done the BiC intro day. It’s designed around busting your bread issues and getting some sourdoughs bubbling- it involves some pre-work and lunch together. Seasonal Hot Toddies and Spiced Drinks making and Tasting! A more perfect pre-holidays Friday you will not find! For just £45.00 a head you will leave with a jar (or more) of Mince Meat for your Mince Pies, and a Christmas Pud ready to be steamed. There will be tasting, and making of mulled drinks, and hot cups, so you will leave armed to the teeth with recipes to try on all your friends and family over the festive party season! We will also have a selection of snacks available, and of course tonnes of good cheer! This workshop is perfect for all levels of makers 15 years+ only please! We are guaranteed to sell out for this workshop - as we have had tonnes of interest so be sure to book on asap. We are very pleased to be welcoming A Royal Exchange Theatre Production, The Mysteries Part 5: Stoke to B arts in October. In Stoke-on-Trent, in a ceramics studio and an old church bell tower, debate rages about how a city and its people might be reshaped. The Mysteries is a cycle of six warm, witty new plays which cross England, from a sheep farm in Eskdale via tourist information centre in Whitby to Manchester. Drop into rehearsals for a cup of tea and meet some of the people making the show - rehearsals are at B arts and will be open to visitors on Tuesday 9th October and Wednesday 10th October between 4 and 5 pm (no need to book for these sessions). BOOK TICKETS: online or in person at B Arts. Alternatively you can call on 01782 848 835 - please leave a message if you can't get through and someone will get back to you.